This month's Pick Hit was so popular that it was preferred by two of our reviewers. 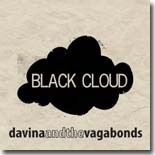 Be prepared to be amazed by the retro blues, jazz and soul sounds of Minnesota-based Davina and the Vagabonds on their new CD, Black Cloud. Ruf Records gathered three of the young female guitar players from their roster for Girls with Guitars, a collaboration from Samantha Fish, Cassie Taylor and Dani Wilde. It's this month's Surprise feature. We go back to the mid '90s to take another look at Too Much Fun, the first of three Alligator albums from zydeco stalwart C.J. Chenier & the Red Hot Louisiana Band. It's this month's Flashback feature. Our What's New section features new releases from Lightnin' Malcolm. Ruff Kutt Blues Band, Sweet Claudette, The Soul of John Black, Hamilton Loomis, Grady Ghampion, Spain's Susan Santos & Papa's Red Band, Harry Manx and Kevin Breit, and more.